Transparency Market Research (TMR) has published a new report titled, “Orthopedic Implants Market - Global Industry Analysis, Size, Share, Growth, Trends, and Forecast, 2018–2026”. According to the new report, the global orthopedic implants market is projected to expand at a CAGR of 4.4% from 2018 to 2026. 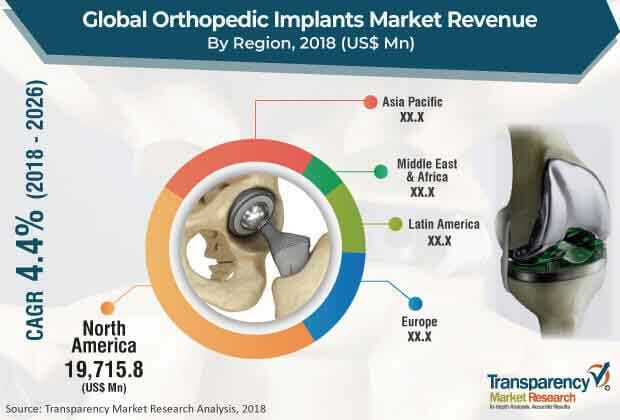 Technological advancements in terms of highly efficient product development and increase in competition among the leading players is positively impacting the global orthopedic implants market while benefitting patients. Increase in the global geriatric population which is more susceptible to musculoskeletal disorders such as osteoporosis, osteonecrosis, osteoarthritis, rheumatoid arthritis, and Perthes Disease is projected to boost demand for orthopedic implants during the forecast period. North America dominated the global orthopedic implants market in 2017 and trend is anticipated to continue during the forecast period. This is attributed to favorable reimbursement for orthopedic procedures and rise in focus of key players on the development of new implants in the market. Increase in the geriatric population and rise in prevalence of osteoporosis in countries such as Japan, China, and India are expected to boost the market in Asia Pacific from 2018 to 2026. Rise in incidence of orthopedic diseases and improving economy in China, India, and other countries in Southeast Asia resulting in high per capita health care expenditure are anticipated to drive the orthopedic implants market in Asia Pacific. Changes in the market composition, policy and regulatory environments will alter the landscape in the near future. The market in the developing regions is characterized by domestic as well as international players. Market share of international players in countries such as China and India is increasing at a rapid pace owing to merger and acquisition activities and new product launches in the region. According to the International Osteoporosis Foundation, the rate of incidence of hip fractures among the people of Asia increased 4-fold to 5-fold in 2013. This is also likely to fuel the growth of the market in Asia Pacific. Economic growth in countries such as Brazil is increasing research & development activities and expenditure on treatment in Latin America. These factors are likely to propel the global orthopedic implants market in Latin America. The report provides profiles of leading players operating in the global orthopedic implants market. These include Zimmer Biomet Holdings, Inc., DePuy Synthes, Stryker, Smith & Nephew, Medtronic Spinal, DJO Global, Arthrex, Inc., NuVasive, Inc., and Globus Medical. Expansion of portfolio by developing new products or through acquisition and licensing agreements to develop products is a key strategy adopted by these players. For instance, in September 2016, Stryker entered into an agreement to acquire the assets of Instratek, Inc., a U.S.-based orthopedic implants and endoscopic instrumentation manufacturer. This acquisition strengthened Stryker’s presence in the forefoot and upper extremity segments. Other key players are also adopting similar strategies. Large number of global manufacturers are putting constant efforts in the development and manufacture of novel orthopedic products to meet the medical need of patients. Demand for advanced technologies such as minimally invasive surgery (MIS), navigation technology, 3D bioprinting and tissue engineering, and custom made implants is increasing. Key players are focusing on the development of new implants with better efficacy. For instance, Medtronic launched the titanium 3D printed platform, TiONIC Technology, which enables incorporation of integrated surface technologies and complex designs in spine surgery implants. Such key developments are likely to augment the global orthopedic implants market in the near future.